NOW OUT OF PRINT (October 2017). This painting depicts Amitabha, the Buddha of Boundless Light, in his Sino-Japanese form as Amida Buddha, who stands upon the seed-head of a colourful lotus with many petals. Amitabha is golden in complexion and his divine form is endowed with the thirty-two major marks and eighty minor signs of an enlightened Buddha. He wears an undergarment of green silk, and the outer robe of a Buddhist monk that is fashioned from sewn patches of richly embroidered silk. With his raised right and lowered left hands Amitabha makes the combined gestures of giving refuge or protection and bestowing supreme generosity, with his index fingers and thumbs touching to form circles and the other fingers extended to represent the ‘Three Jewels’ of the Buddha, Dharma and Sangha. These two hand gestures are characteristic of Amitabha as he welcomes those who are fortunate enough to take rebirth into his Western Paradise or Pure Land of Sukhavati, the ‘Blissful Realm’. 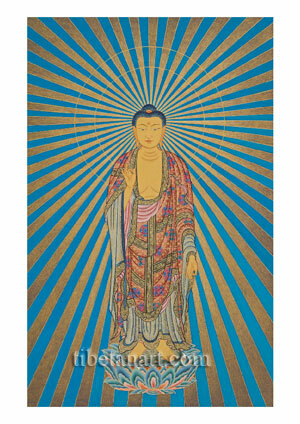 Rays of golden light emanate towards the eight directions from the crown of Amitabha’s head, filling the blue immensity of space with his luminous and compassionate presence.